No more faxes, telephone calls and emails coming from schools and daycare facilities for you to keep organized. Save time and effort with our secure, user friendly, web-based tools designed to make life a bit easier. 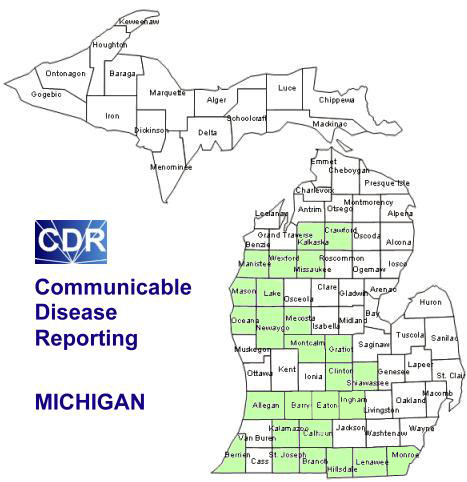 KKzo LLC offers a Health Insurance Portability and Accountability Act (HIPAA) compliant web based application allowing you a better way to accrue infectious disease statistics from schools and other sources for the purposes of reporting those statistics to the State of Michigan. School and daycare users of the CDR tools can input data each reporting week from Monday 12:01 a.m. to Sunday 11:59 p.m. via the Internet no matter where they connect. Subscribing counties are provided access and tools to manipulate the data as needed to create reports for internal usage as well as for reporting to the state. As part of the CDR application, a secure web location is provided allowing counties to share related files with other agencies. Control of these files, including addition and deletion of files, is granted to a single user at the county level who serves as the county's administrative user. Certain bandwidth limitations may apply. Access to the CDR system requires a user and password. Those are created by KKzo and managed by the designated county employee. This same county employee will be trained to be the contact point for low-level technical assistance. All users will enter data in an encrypted environment. All administrative tools operate exclusively in the same encrypted environment. Each site user leaves an identifying footprint when using the site resulting in an accountability log. Add, Delete and Edit schools and daycare facilities. This will include the login information for each. The county has the ability to disable access without deleting the account or data. 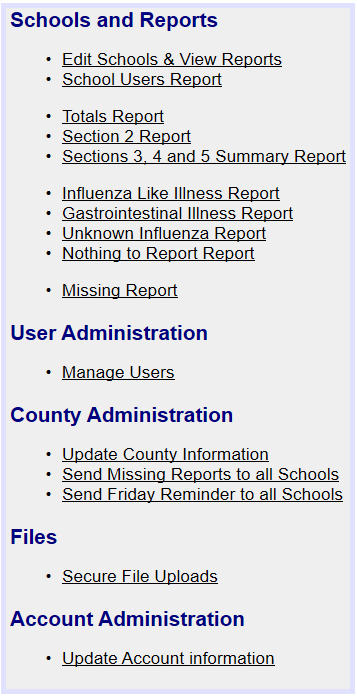 View the reports for each school or daycare facility and edit their report if errors have been found. View the last period a school or daycare facility reported and see an indication if a section 2 report was made. View a report for section 2. This report shows all section 2 reports for all schools or daycare facilities. This report is available in either HTML or CSV format and can be limited to a specified date range. View totals reports for sections 3, 4 and 5 of individual schools and daycare facilities or all. This report shows values by individual weeks. This report is available in either HTML or CSV format and can be limited to a specified date range. View a summary report for sections 3, 4 and 5. This report shows the total number of reported diseases for each school or daycare facility within the specified date range. This report is available in either HTML or CSV format and can be limited to a specified date range. View a report for the enabled schools and daycare facilities that have not reported for a specific week. This report is available in HTML or CSV format. Each county is assigned a specific HTTPS web address their schools and daycare facilities use to make reports. Users will be redirected to an HTTPS web address if they fail to type the address using HTTPS. Each school or daycare facility has their own login account allowing them to enter/add/edit the reporting information for the week. They are able to continue updating the data until midnight Sunday when the new reporting period begins. Each school or daycare facility receives an automatic email notification to contact the county with weekly numbers any week they fail to report. Each county's main authorized user is able to upload files securely to the server resulting in a URL for the file. That URL is given to the intended viewer(s) of the file. When the file is download, the county can provide the password generated to view that file. When downloading the secured file, intended viewers are prompted for their e-mail address and the password related to this file. When the password has been validated, the file will download. All file uploads and downloads will be logged to maintain high security. The user who uploaded the file, plus the date, time, file name, and description of the files will be logged. For downloads, the e-mail address and time of the download will be logged. The user at the county will then delete the file from the server. When the file is deleted, the physical file will be deleted, but the related logs remain. For the average Internet user, the CDR program will be very intuitive. Nonetheless, KKzo L.L.C. 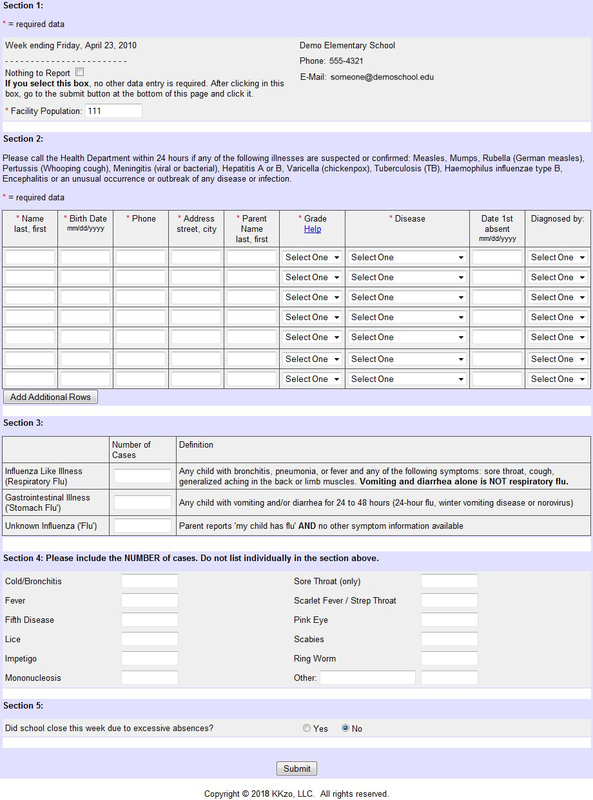 will provide the person selected by your county as the administrative user with training and a detailed FAQ for reference. Low level support will be provided to schools and daycare facilities by the county's trained administrative user and we will support that person. We will respond to support requests in less than one business day in most cases. We are experienced in providing user support for many types of applications and have been designing web based tools since 1993. Our clients are more than satisfied with our efforts to provide dependability in our support and quality in our workmanship. We believe it is our job to provide you with more than you get from any other solution providers. Copyright © 2010-2015 KKzo L.L.C. All rights reserved.